On Nov. 12, 1869, George Allan and others formally requested that a new county school district be formed along the King County line at Park Place. This was the beginning of public education in the Monroe area. The new district was duly formed on Nov. 23 as School District No. 2, the second school district to be formed in Snohomish County. The first had been formed at Snohomish on May 7, 1865. 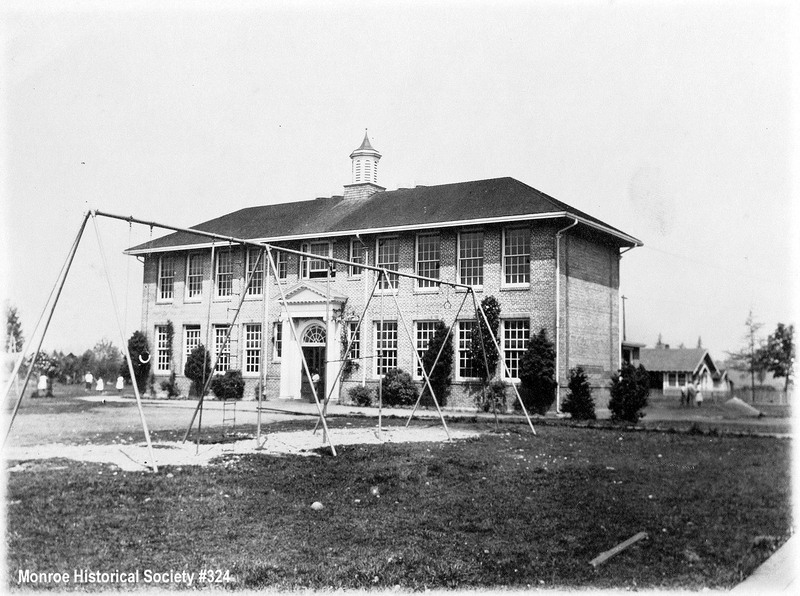 The idea of public eduation was important to the early settlers of Snohomish County. In 1861, the year the county was formed, a school tax was levied although there were no pioneer children yet living in the county. As the settler population increased, local school districts were formed where there were enough children to support a school. Funding came from county and state sources as well as from the parents. At first, classes were usually held in someone’s home. Initially attendance was low and terms were short in part because children were needed to work at home and on the farm and because the school was often several miles distant. On November 1, 1869, E. C. Ferguson, the clerk for the Snohomish School District made his annual report to the first County Superintendent of Schools, Henry McClurg of Park Place. Ferguson wrote: I herewith submit my yearly report as the law directs. A school has been kept in the district by a qualified teacher for a term of three months. During the past season, the attendance was very small in proportion to the number of scholars in said district, say about one-fifth, all of which were in the primary class. The amount of wages paid for the term in legal tender was $188.59. No other moneys have been expended from the school fund during the past year. On Nov. 9, 1870, George Harriman the clerk for the Park Place School District reported that no school had been held during 1870 although there were 14 school-age children in the district. Snohomish had held school for a term of six months that year with 18 in attendance out of a possible 47 school-age children. County school funds were divided between the two districts with Snohomish receiving $296.71 and Park Place $119.60. Henry McClurg as County Superintendent of Schools received $25. In 1889, County Superintendent of Schools J. W. Heffner reviewed early county school history and wrote in part: District No. 2 (Park Place) was formed from District No. 1 in 1869. In 1879 it had twenty pupils, while in 1889, there were forty-two. The district has a schoolhouse which is also used as a church, and has levied a tax for a $500 building. District 7, Tualco, has a schoolhouse which cost $750, which will soon be provided with patent seats. The construction of the Great Northern Mainline one mile east of Park Place in 1892 spelled the end of Park Place as the business center for the Monroe area and over the next decade most of the significant buildings in Park Place were moved east to the railroad tracks. The first to move was the Vanasdlen Store and Post Office. In 1899, the school building was moved and became the first school building in Monroe proper at the three-acres school site on the southeast corner of Ferry and Fremont Streets. A second building was added to the first the following year and in 1904 another school building was added to the site. During the first decade of the twentieth century Monroe grew rapidly and in 1911, a handsome new two-story brick schoolhouse was built in the Park Place area and was in use until 1955 when the new Frank Wagner Elementary School was opened a half-mile to the east. and from information compiled by Bill Wojciechowski.